The most important thing for the new country to do after the Declaration of Independence was to establish a constitution for themselves. The Continental Congress would start writing this directly after the Declaration, but this task would take them 16 months to finish. The strong political ideologies in Congress made any decisions a tough task, and their meetings were full of debates that often turned into arguments. For this reason alone, it is important to be careful about blanket statements about what the founding fathers thought. It is popular on the left and the right side of politics to take a quote from a single founding father and to believe that it conveyed the beliefs of all of the others, but this is simply incorrect. In reality the founding fathers fought about every aspect of our country, just like we would now if we had to recreate the experiment. Congress would eventually pass this as our constitution in a 9-4 vote and would then send it to the individual states to try to ratify it. Each state would have to agree to this constitution in their own ratification process in order to officially use this document. This became much more difficult than most people understand due to a major fight over what to do with western lands. Maryland would refuse to ratify for a long time because of everyone trying to claim more land in the west, and it would end up taking 3 years to fully ratify this Constitution. 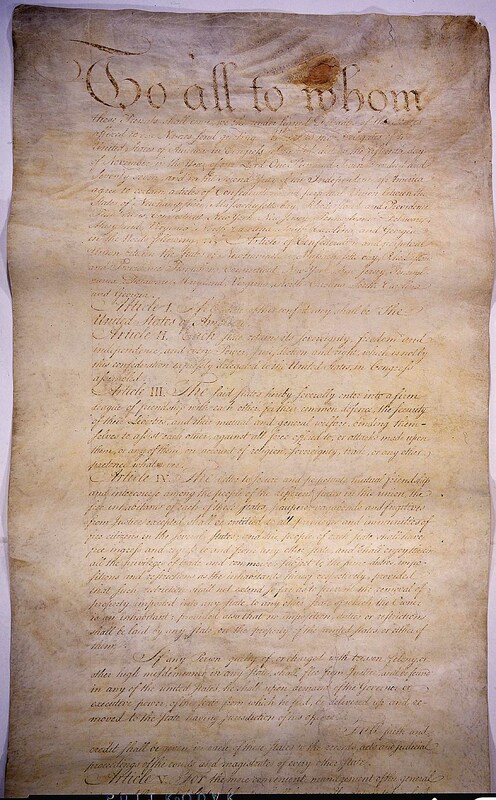 Once it was done, the Articles of Confederation would represent the first constitution of our county. One of the most clear themes of the Articles of Confederation was the fear of a strong central government. People were in fear of someone in America ending up with the same amount of power that King George II had, so they were very interested in keeping power in the hands of the states instead of a Federal government. The Articles would create a loose confederation of states that work together for mutual defense but think of themselves as very separate. The term state itself actually means something similar to country, which was how they thought of themselves, but later developments in America would add an additional meaning which is more similar to province. So when they named the country the United States of America they really meant something similar to the United Countries of America. They would have no executive branch (like the president) because they feared the president taking too much power. the power to resolve disputes between states and create currency but had no actual power to force the states to agree to any of this, so these powers became mostly irrelevant. There was a large debate over who would be allowed to vote for this legislative body. Many founding fathers believed that allowing too many people to vote would turn into mob rule. Others added that allowing the ignorant masses the same amount of influence as the intelligent people would cause major problems. Another problem was whether to allow certain minority groups the right to vote. A great deal of time was spent talking about whether to allow Jewish people the right to vote. Problems with the Articles of Confederation would be clear soon after the constitution was ratified. While the idea of central power isn’t always popular it is actually needed in order to get certain things done. This lack of cohesive leadership among the states would make this country very chaotic in the early days with no one to provide singular direction. The fact that the government couldn’t collect taxes, but could only ask nicely for them, made the idea of paying off the national debt (from the Revolution) a nearly impossible task. The government tried to create a currency for the country but it was only backed by this amazingly weak government, so they became worthless scraps of paper while the individual states created their own currency. The lack of money and power also made it impossible to have any sort of standing defense with a military, which was becoming more of a problem due to skirmishes with the Native Americans. On top of all of this, the constitution made it nearly impossible to make any changes because changes required a unanimous vote among the states. The legislature did find unique ways to pay for things despite having no real power to tax people. This usually revolved around the intense desire of the states to move into western lands. Each state would create plans on extending their state to the west in order to help themselves economically. These competing claims became such a problem between the states that they would cede the power to decide the issue to the legislature (1781). The Land Ordinance of 1785 would fix this issue by providing rules for new towns in the west and create rules for statehood. This land would be auctioned off by the government and they would use the money to pay off debts from earlier. They would later create the Northwest ordinance, which would create further rules on how to admit states to the union in the northwest. They could petition for statehood if they had 5,000 free white men, had abolished slavery, and grant religious freedom (among other things). This law also promised to treat the Native Americans with respect, but since they were given no specific rights by law this was rarely actually used. This constitution was a landmark in history, due to being one of the first written constitutions ever made, and gave its people specifically outlined rights that they could count on, which was still a relatively new concept. More importantly it gave needed stability during the American Revolution and gave our founding fathers experience that they would use in the creation of the next constitution.